However, despite the vast wealth of information regarding this subject, we are actually seeing more and more people succumb to the pernicious effects of these lifestyle choices. 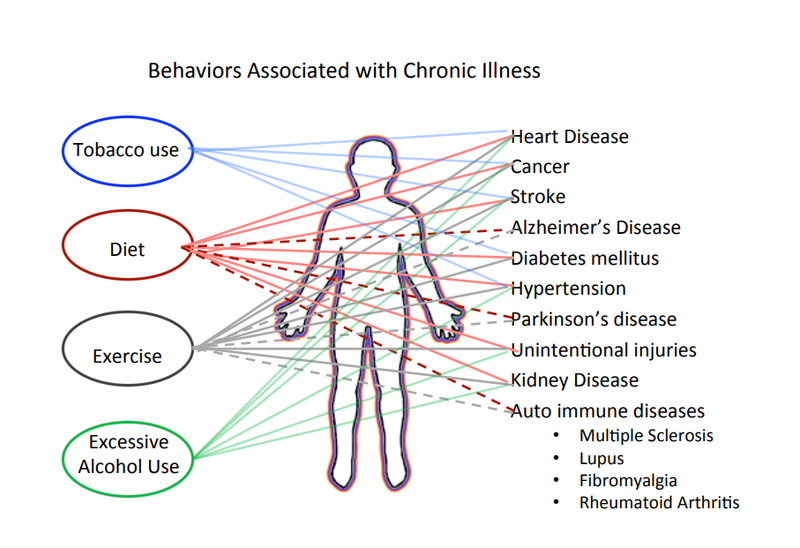 Beyond the deaths associated with these behaviors, chronic illnesses and quality of life are greatly impacted as well. In fact, in the U.S., chronic diseases account for 86% of all medical claims. As we mentioned, what makes this issue so troubling is the fact that many of these chronic diseases could be prevented, delayed, or alleviated through lifestyle changes. In fact, according to this study by the Partnership to Fight Chronic Disease, if Americans were to eliminate these three risk factors we could prevent 80% of heart disease and strokes; 80% of type two diabetes; and 40% of cancer. This raises the question: should all of our programs be focusing on diet and exercise, smoking cessation, and alcohol abuse? Possibly, but at Balanced Wellness we would contend that a total wellness approach is actually the more effective and encompassing method. Taking a comprehensive approach allows us to address the key, underlying issues and foster sustainable change. For instance, consider how often we hear our peers comment on how busy and “stressed” they are. And if we were to add the task of eating well and exercising to the equation, the situation would only get worse. Specifically, it could make them feel more overwhelmed and stressed, which could not only increase smoking and alcohol consumption as a means of self-medication, but it could also derail their goal of living a healthier life. At Balanced Wellness, we believe we are better off not taking a reductionistic approach and focusing on one behavior or the other. Offering a comprehensive, total wellness program is a more sustainable and effective strategy. In our wellness programs, for example, we would target a bad habit, like smoking, by adding components to our smoking cessation program that focus on NOT replacing smoking with food in the mouth but instead focusing on the underlying issue—in this case, focusing on stress management and physical activity along with social support. Additionally, we would warrant that exercise and nutrition programs alike need to focus on all dimensions of wellness. As we’ve surely mentioned before, getting people in the habit of thinking critically about their personal health is the first step in achieving and maintaining optimal health. To accomplish this goal, we strive to educate participants on the multifaceted nature of health and wellness—lifestyle, exercise, diet, mentality, etc. When we look for behavior change, we often talk about knowledge-attitude-skills. Supplying VALID information for knowledge is critical. However, Internet searching is not always the best friend for those looking for accurate, supportive health information. Rather the skills needed to see real, lasting results take time to refine and hone. This is where coaching can greatly help. A passionate, experienced, coach can assist you with menu planning, implementing stress management techniques, deciding what level of exercise is best for results and sustainability, and ultimately with developing a realistic action plan to help you become your very best self. Learn more about our health and wellness coaching here. While knowledge and skills are important, it is quite likely that attitude and readiness to change are just as important—if not more important! There has been much research done on ‘mindset’ and how it applies to behavior change. Constantly playing negative messages in our brain can be the tipping point for not adhering to the strategies we know can improve our overall well-being. If we remind ourselves enough that it is easier to eat fast food than to cook simple healthful foods, we will not be receptive to any real meaningful change. Improving our skill of meal planning and preparing nutritious foods becomes a habit when we truly want and believe we can accomplish the task with experience. Our “Real Life” Healthy Eating Program is a great start to becoming proficient at creating a hand healthy eating exercise plan without adding stress! Overcoming the risk factors of chronic diseases is no easy task—especially when these risk factors are embedded in your daily routines. It takes awareness and a deliberate lifestyle to achieve total wellness. At Balanced Wellness, we fully understand this, and it’s an understanding that informs all we do. We aspire to simplify the health education process, get people in the habit of thinking critically about their personal health, and ultimately send them down the path toward optimal wellness. 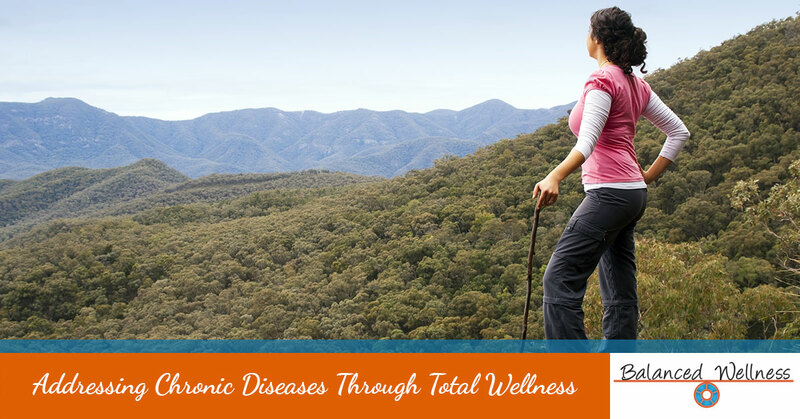 Ready to take the steps to address preventable chronic diseases? Contact Balanced Wellness! By integrating our flexible wellness programs into your community and workplace groups, you can help yourself and your peers achieve and maintain optimal well-being.